The Designation of Origin Ribeiro is located in Galicia, on the northwestern edge of the province of Ourense and at the confluences of the valleys formed by the rivers Miño, Avia and Arnoia. A small region situated at 45 km. of the Atlantic Ocean, in a very particular area and of excellent aptitude for the cultivation of the vine. 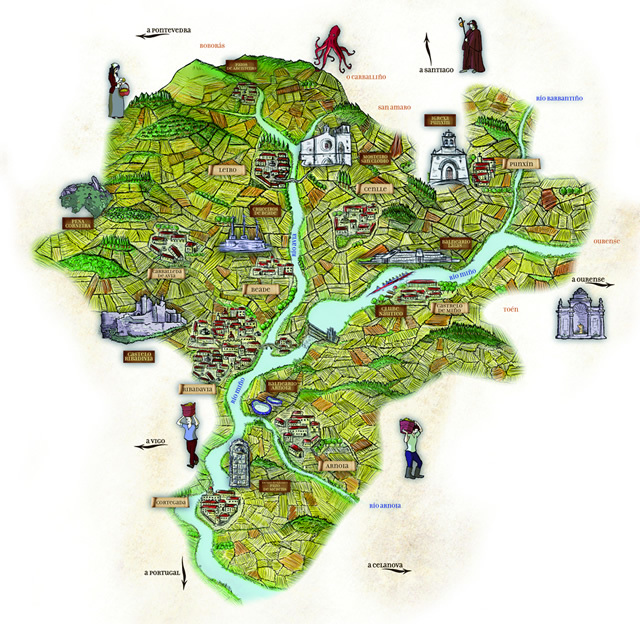 Ribeiro has an approximate extension of 2,500 hectares of vineyards under the protection of the Designation of Origin, covering the townships of Arnoia, Beade, Ribadavia, Carballeda de Avia, Castrelo de Miño, Cenlle, Cortegada, Leiro, Punxín and Ribadavia and parts of Borborás, Ourense, O Carballiño, San Amaro and Toén. The climate is a key factor that determines the agronomy, varieties and styles of wines. The D.O.Ribeiro is located in a transition zone in Galicia of Mediterranean character, softened by the Atlantic due to the short distance from the ocean. In fact, this short distance should give the environment a mayor Atlantic character but the terrains of mountain chains that limit the designation in the west and in the north has a protective effect, creating a viticulture where the alcoholic ripeness develops in parallel to phenolic ripeness, keeping a fresh balance thanks to the natural acidity with a dominance of the tartaric over the malic acids. The light continental character, along with the dominant air currents, cause a wide temperature range between day and night which favours the slow ripeness respecting the aromatic component and the natural freshness. 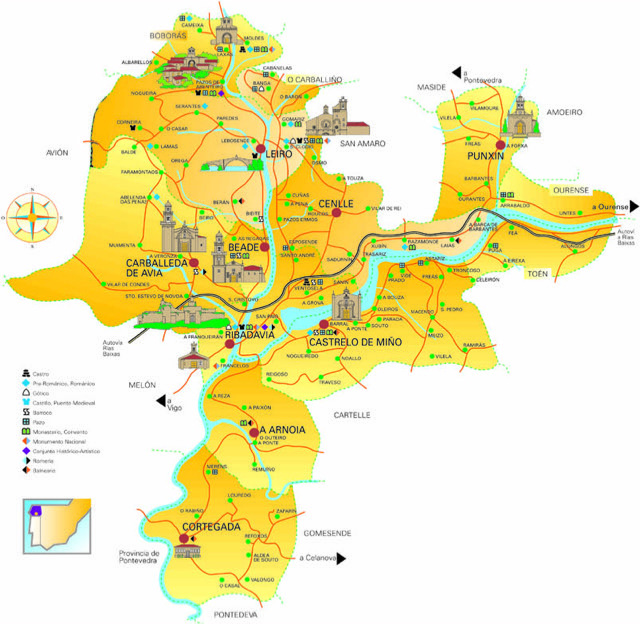 The three valleys in the Ribeiro feature three main rivers: Miño, Avia and Arnoia. The natural environment is formed by slopes and terraces, excellent for high quality wine growing, in addition to the peculiar microclimate, ventilated and with an excellent sun-exposure for the Ribeiro native varieties ripeness. The sea influence that comes from the Miño river creates belts of natural transition zone between two distinct ecosystems over the hillsides, creating a mayor Atlantic character as the height goes up, which limits the crops to approximately 450 metres high for the Denominación de Origen varieties. 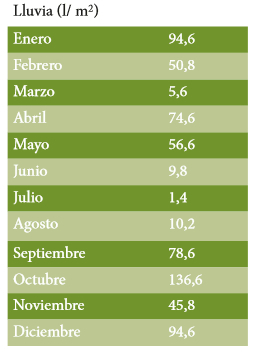 The table below shows the rains for the year 2015 taken by the weather station of the EVEGA in Leiro. 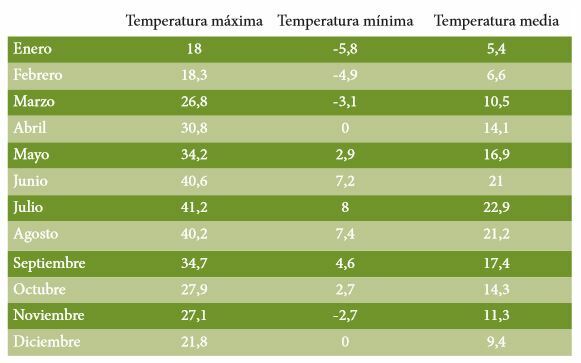 The table below shows the temperatures for the year 2015 taken by the weather station of the EVEGA in Leiro. Average temperature per year: 14.5º C Average rainfall per year: 950mm. Hours of sun: 1,915 hours, 40% in July-August and a minimum of 8% in December-January. Ribeiro has been a wine growing zone for a very long time. Since the Benedictine monks regained agriculture at the end of the first millennium until now, the characteristics of the cropped soils have changed from natural soils, as they have been nurtured for generations. Ribeiro soils are divided in three types. Most of them are composed of granite-like materials, with sandy loam Texture and, to a lesser extent sandy-loamy silt one. There are also soils of schist metamorphic texture, and others made from sedimentary material with loamier textures. Something that makes Ribeiro unique is the “sabrego” decomposed granite, plentiful there. Soils for growing are an average of 70 to 100 cm deep. They are very sandy, especially on the superficial level which contrasts with the low content of clay, below 20%. They are usually acidic, poor in organic material and low in calcium. Most of the cropping soils are terraced in order to decrease the slopes and to make the ploughing easier and to exploit the hillsides and the sun-exposure. One characteristic of the certificate of Origin Ribeiro land is the small-scale farming, the complex terrain and the use of traditional techniques for grape-growing. The wine grower has always traditionally been an important and relevant figure in the D.O. Ribeiro. 5,5000 of them are currently registered, in addition to 115 wineries and “colleiteiros” (harvesters). They represent the production structure of the Denominación. With 2,500 hectares of vineyard and an average yield of14million kilos of grape, the Ribeiro Designation of Origin is characterised by its great diversity and parcelling, a winegrowing heritage that represents the Galician heritage by its landscape, territory and human factor. Tradition is not history. Tradition is eternity. Historically winegrowing has always been the main source of wealth in the region. The origin of the Ribeiro native varieties is uncertain but Estrabón’s testimony stated that wine in Ribeiro was already grown in the second half of the 2nd century BC, evidence that is also found in the discovery of winepresses from that period. There were already complex varieties quite well adapted to the weather conditions in Ribeiro in 3rd century. The later German invasions meant a significant setback in winegrowing in the region although it did not disappear. It re-emerged in the early Middle Ages, becoming one of the main crops by the year 1000. During this period the most important Galician ecclesiastical centres set up farms and priories to provide wine to their main sites. Monasteries were the major drivers of the vineyard, stimulating its cultivation with specific regional contracts. Important aristocratic families, as well as average and big landowners also showed interest in buying vineyards in Ribeiro in the 11th century. Some of the main pioneers of the vineyard recovery were the Benedictine and Cistercian monks from San Clodio monastery although the native varieties already existed. The abbot, Pelagio González ( 12th century) states in his will the great work for the vineyard reintroduction and flaunted the excellent quality of the wines that got to the rest of Europe through local merchants, English, Dutch, Asturians and Basque people under the protection of “El Camino de Santiago” – Santiago route- as well as Jewish merchants who left their historical and monumental legacy in Ribadavia. The monks of the Oseira and Melón monastery , founded by the Cistercian Order, were prominent in the Ribeiro vineyard development . 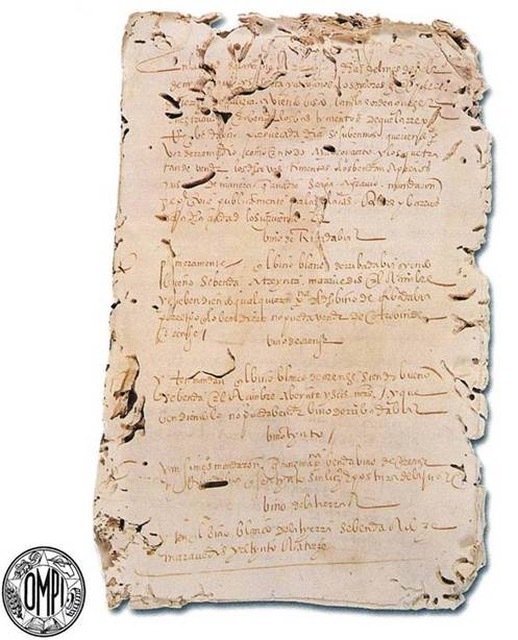 Documents from the 12th and 13th century proved that the Oseira monks signed contracts with several landowners in the Ribeiro zone for wine growing. So did the monks from Celanova, San martiño Pinario and Cabildos of the Santiago, Lugo and Orense cathedrals. They went to live in the Ribeiro area where they had big vineyards at their disposal and where they ran numerous farms and priories. The flourishing trade and the appreciation for Ribeiro wines are reflected in the approval of a decree where food prices sold in Santiago de Compostela in 1133 are stated. Ribeiro wine was the most expensive of them. A few centuries later English people became the main customers outside the peninsula. The Ribeiro zone was hardly affected by the Muslim invasion so the wine growing steadily progressed from the Roman times to its most splendour in centuries XV and XVI. During these centuries the wine became the biggest wealth in Ribeiro, prestigious, with big yields, and was exported everywhere in Spain and to Europe ( France, Portugal, Italy and especially Great Britain). It was transported in carriages to various ports, Pontevedra being the main one as well as Vigo, Baiona and A Coruña. It was taken from there to the Gulf of Vizcaya, then to Britany, Flanders and England. The Ribeiro wines got even further. These wines sailed with the first settlers to America, consequently they were the first wines to be tasted in the New World. Documentary evidence shows that in 1592, at the port of Ferrol, 127 barrels of Ribeiro wine costing 190 Reales were loaded on board onto a ship bound for America. They were on board with Christopher Columbus when he discovered America. Along with the strong economic flow illegal trade arises. In order for the quality to be guaranteed and to protect the product, Ribadavia municipal ordinances stipulated growing zones and aspects related to the wine yield and its trading with the purpose of avoiding the wine adulteration and the picaresque that pretended to sell products from dubious origins as Ribeiro ones. Those ordinances are a precedent for the present regulations of the D.O. In fact, the “OMPI” (World Organization of Intellectual Property) acknowledges them as the first evidence of a protection of a geographical indication in Spanish laws. During the whole 16th century and half of 17th Ribeiro wine had a flourishing and cultural trade. Cervantes mentioned it in several of his novels. It was one of Galician greatest wealth until the plagues coming from America devastated the region in the 19th century. In 1853 the odium broke out, then a second plague, the mildium, in 1886, the third one, the phylloxera, in 1890 onwards. It was then when it became necessary to graft vines onto American rootstock which led to the introduction of more resistant and productive foreign varieties at the expense of native ones. Ribeiro is currently coming back to its origin using local grapes, recovering and creating new plantations through restructuring and conversion of the vineyard. In addition, new wineries have joined in in the last decades which, along with new technologies, aim to get the best quality and the historical expression of the wine culture.